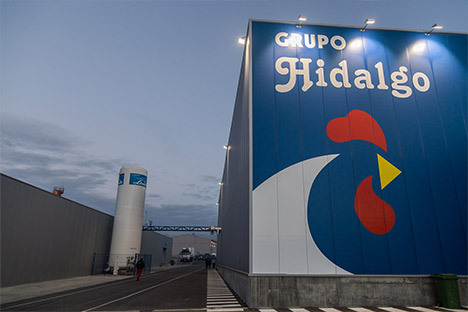 The HIDALGO Group, integrated by Castilla Poultry Farms, Poultry Processing Center of Iscar and Distributions Hidalgo, has 50 years dedicated to the poultry sector. Thanks to an excellent integration, the three companies of the group perform an efficient production process that begins with breeding animals and ends with their marketing. Our main objective is to satisfy customer needs through a qualified team of professionals who work every day to get the best products. We also count with the latest technology facilities to ensure detailed control throughout the whole production process; this has made our Group stand out in a great variety of areas and sectors: wholesale and retail companies, reaching all points of Spain. Therefore, we invite you to visit our company and enjoy a wide range of products that we put at your disposal. Our group also participates in the IBEROELABORADOS business, especially dedicated to the manufacturing of the fresh poultry products of prime quality, expanding their products offer.